NETWORK FINALS: FOX’s COLLEGE FOOTBALL game adjusted to 2.2. 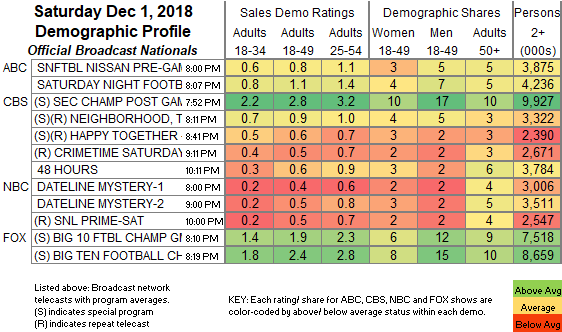 In addition, CBS’s late afternoon game caused adjustments to THE NEIGHBORHOOD (down 0.6) and HAPPY TOGETHER (down 0.1). Each hour of NBC’s DATELINE also lost 0.1. CABLE HIGHLIGHTS: ESPN’s COLLEGE GAMEDAY led Saturday cable at 0.58, with the network’s COLLEGE FOOTBALL games at 0.26/0.25. A&E’s LIVE PD slipped 0.02 to 0.57. Hallmark’s movie MINGLE ALL THE WAY was at 0.56. 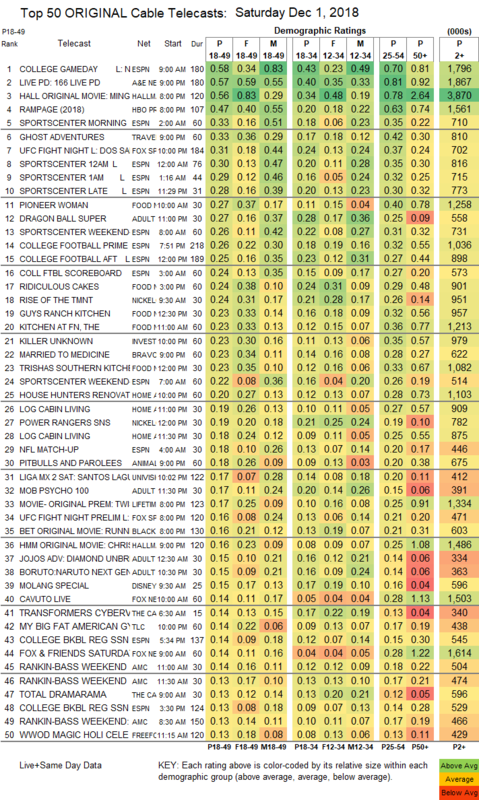 Travel Channel’s GHOST ADVENTURES was steady at 0.33. Fox Sports 1’s UFC FIGHT NIGHT was at 0.31. On Food Network, PIONEER WOMAN held at 0.27, KITCHEN AT FN ticked down to 0.23, and TRISHA’S SOUTHERN KITCHEN was up 0.03 to 0.23. Adult Swim’s line-up performed as follows: DRAGON BALL at 0.16/470K and 0.27 compared to last week’s 0.14/450K and 0.26, MY HERO ACADEMIA down 0.01 to 0.13/396K, NARUTO up 0.03 to 0.15/391K, BORUTO up 0.02 to 0.15, MOB PSYCHO 100 up 0.02 to 0.17, ATTACK ON TITAN steady at 0.16/360K, JOJO’S BIZARRE ADVENTURE steady at 0.15, BLACK CLOVER up 0.03 to 0.18/358K, HUNTER X HUNTER up 0.04 to 0.17/338K, FLCL up 0.05 to 0.15/304K, POP TEAM EPIC up 0.06 to 0.13/263K, LUPIN THE 3RD up 0.06 to 0.12/248K, and SAMURAI JACK up 0.04 to 0.11/29K. Nickelodeon’s morning RISE OF THE TMNT was at 0.24, with lead-in POWER RANGERS at 0.19. ID’s KILLER UNKNOWN gained 0.02 to 0.23. Bravo’s MARRIED TO MEDICINE was at 0.23. HGTV’s HOUSE HUNTERS RENOVATION was steady at 0.20. Lifetime’s movie A TWIST OF CHRISTMAS was at 0.17, BET’s movie RUNNING OUT OF TIME was at 0.16, and HMM’s movie CHRISTMAS WONDERLAND was at 0.16. TLC’s MY BIG FAT AMERICAN GYPSY WEDDING fell a tenth to 0.14. On OWN, READY TO LOVE ticked up to 0.09, and CHAD LOVES MICHELLE held at 0.05. Paramount’s BELLATOR LIVE was at 0.05.